Almost instantly regretted coming into this place before I had even ordered. Straight from the off I received a dirty look off a guy at the bar. Not being put off I went to the bar to be met by an uninterested barmaid. Went for the Cumberland by Jennings, it was 3.20 and wasn't a bad pint to be fair. It seemed okay when I settled down a bit but a the atmosphere was a bit weird I thought. Nothing much that makes this place stand out to me, don't think I would ever come back. Back here for the first time in 5 years. The barmaid was very knowledgeable about her beers and we tried a new local brewery's beer in a bottle. Landlord and Cumberland Ale were the two ales. It was very quiet on our Sunday afternoon visit. Upgrading my rating slightly. Not the pub it once was. Still found it reasonable though - the Landlord was drinkable though am not sure what 'sty'e' the upper room is supposed to be. There's plenty of better pubs around this area than this one. There was only one customer in on a Sunday afternoon until we walked in. 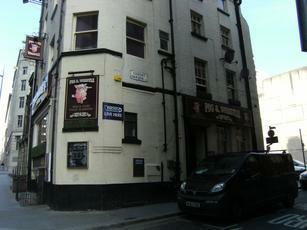 The two real ales - Landlord and London Pride were uninspiring.